As the term suggests, marketing communication functions within a marketing framework. Traditionally known as the promotional element of the four Ps of marketing (product, place, price, and promotion), the primary goal of marketing communication is to reach a defined audience to affect its behavior by informing, persuading, and reminding. Marketing communication acquires new customers for brands by building awareness and encouraging trial. Marketing communication also maintains a brand's current customer base by reinforcing their purchase behavior by providing additional information about the brand's benefits. A secondary goal of marketing communication is building and reinforcing relationships with customers, prospects, retailers, and other important stakeholders. Successful marketing communication relies on a combination of options called the promotional mix. These options include advertising, sales promotion, public relations, direct marketing, and personal selling. The Internet has also become a powerful tool for reaching certain important audiences. The role each element takes in a marketing communication program relies in part on whether a company employs a push strategy or a pull strategy. A pull strategy relies more on consumer demand than personal selling for the product to travel from the manufacturer to the end user. The demand generated by advertising, public relations, and sales promotion "pulls" the good or service through the channels of distribution. A push strategy, on the other hand, emphasizes personal selling to push the product through these channels. 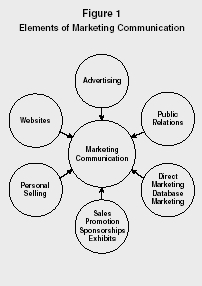 For marketing communication to be successful, however, sound management decisions must be made in the other three areas of the marketing mix: the product, service or idea itself; the price at which the brand will be offered; and the places at or through which customers may purchase the brand. The best promotion cannot overcome poor product quality, inordinately high prices, or insufficient retail distribution. Likewise, successful marketing communication relies on sound management decisions regarding the coordination of the various elements of the promotional mix. To this end, a new way of viewing marketing communication emerged in the 1990s. Called integrated marketing communication, this perspective seeks to orchestrate the use of all forms of the promotional mix to reach customers at different levels in new and better ways. The evolution of this new perspective has two origins. Marketers began to realize that advertising, public relations, and sales were often at odds regarding responsibilities, budgets, management input and myriad other decisions affecting the successful marketing of a brand. Executives in each area competed with the others for resources and a voice in decision making. The outcome was inconsistent promotional efforts, wasted money, counterproductive management decisions, and, perhaps worst of all, confusion among consumers. Secondly, the marketing perspective itself began to shift from being market oriented to market driven. Marketing communication was traditionally viewed as an inside-out way of presenting the company's messages. Advertising was the dominant element in the promotional mix because the mass media could effectively deliver a sales message to a mass audience. But then the mass market began to fragment. Consumers became better educated and more skeptical about advertising. A variety of sources, both controlled by the marketer and uncontrolled, became important to consumers. News reports, word-of-mouth, experts' opinions, and financial reports were just some of the "brand contacts" consumers began to use to learn about and form attitudes and opinions about a brand or company, or make purchase decisions. Advertising began to lose some of its luster in terms of its ability to deliver huge homogeneous audiences. Companies began to seek new ways to coordinate the multiplicity of product and company messages being issued and used by consumers and others. Thus, two ideas permeate integrated marketing communication: relationship building and synergy. Rather than the traditional inside-out view, IMC is seen as an outside-in perspective. Customers are viewed not as targets but as partners in an ongoing relationship. Customers, prospects, and others encounter the brand and company through a host of sources and create from these various contacts ideas about the brand and company. By knowing the media habits and lifestyles of important consumer segments, marketers can tailor messages through media that are most likely to reach these segments at times when these segments are most likely to be receptive to these messages, thus optimizing the marketing communication effort. Ideally, IMC is implemented by developing comprehensive databases on customers and prospects, segmenting these current and potential customers into groups with certain common awareness levels, predispositions, and behaviors, and developing messages and media strategies that guide the communication tactics to meet marketing objectives. In doing this, IMC builds and reinforces mutually profitable relationships with customers and other important stakeholders and generates synergy by coordinating all elements in the promotional mix into a program that possesses clarity, consistency, and maximum impact. Practitioners and academics alike, however, have noted the difficulty of effectively implementing IMC. Defining exactly what IMC is has been difficult. For example, merely coordinating messages so that speaking "with one clear voice" in all promotional efforts does not fully capture the meaning of IMC. Also, changing the organization to accommodate the integrated approach has challenged the command and control structure of many organizations. However, studies suggest that IMC is viewed by a vast majority of marketing executives as having the greatest potential impact on their company's marketing strategies, more so than the economy, pricing, and globalization. Advertising has four characteristics: it is persuasive in nature; it is non-personal; it is paid for by an identified sponsor; and it is disseminated through mass channels of communication. Advertising messages may promote the adoption of goods, services, persons, or ideas. Because the sales message is disseminated through the mass media—as opposed to personal selling—it is viewed as a much cheaper way of reaching consumers. However, its non-personal nature means it lacks the ability to tailor the sales message to the message recipient and, more importantly, actually get the sale. Therefore, advertising effects are best measured in terms of increasing awareness and changing attitudes and opinions, not creating sales. Advertising's contribution to sales is difficult to isolate because many factors influence sales. The contribution advertising makes to sales are best viewed over the long run. The exception to this thinking is within the internet arena. While banner ads, pop-ups and interstitials should still be viewed as brand promoting and not necessarily sales drivers, technology provides the ability to track how many of a website's visitors click the banner, investigate a product, request more information, and ultimately make a purchase. Through the use of symbols and images advertising can help differentiate products and services that are otherwise similar. Advertising also helps create and maintain brand equity. Brand equity is an intangible asset that results from a favorable image, impressions of differentiation, or consumer attachment to the company, brand, or trademark. This equity translates into greater sales volume, and/or higher margins, thus greater competitive advantage. Brand equity is established and maintained through advertising that focuses on image, product attributes, service, or other features of the company and its products or services. Cost is the greatest disadvantage of advertising. The average cost for a 30-second spot on network television increased fivefold between 1980 and 2005. Plus, the average cost of producing a 30-second ad for network television is quite expensive. It is not uncommon for a national advertiser to spend in the millions of dollars for one 30-second commercial to be produced. Add more millions on top of that if celebrity talent is utilized. Credibility and clutter are other disadvantages. Consumers have become increasingly skeptical about advertising messages and tend to resent advertisers' attempt to persuade. Advertising is everywhere, from network television, to daily newspapers, to roadside billboards, to golf course signs, to stickers on fruit in grocery stores. Clutter encourages consumers to ignore many advertising messages. New media are emerging, such as DVRs (digital video recorders) which allow consumers to record programs and then skip commercials, and satellite radio which provides a majority of its channels advertising free. Public relations is defined as a management function which identifies, establishes, and maintains mutually beneficial relationships between an organization and the publics upon which its success or failure depends. Whereas advertising is a one-way communication from sender (the marketer) to the receiver (the consumer or the retail trade), public relations considers multiple audiences (consumers, employees, suppliers, vendors, etc.) and uses two-way communication to monitor feedback and adjust both its message and the organization's actions for maximum benefit. A primary tool used by public relations practitioners is publicity. Publicity capitalizes on the news value of a product, service, idea, person or event so that the information can be disseminated through the news media. This third party "endorsement" by the news media provides a vital boost to the marketing communication message: credibility. Articles in the media are perceived as being more objective than advertisements, and their messages are more likely to be absorbed and believed. For example, after the CBS newsmagazine 60 Minutes reported in the early 1990s that drinking moderate amounts of red wine could prevent heart attacks by lowering cholesterol, red wine sales in the United States increased 50 percent. Another benefit publicity offers is that it is free, not considering the great amount of effort it can require to get out-bound publicity noticed and picked up by media sources. Public relations' role in the promotional mix is becoming more important because of what Philip Kotler describes as an "over communicated society." Consumers develop "communication-avoidance routines" where they are likely to tune out commercial messages. As advertising loses some of its cost-effectiveness, marketers are turning to news coverage, events, and community programs to help disseminate their product and company messages. Some consumers may also base their purchase decisions on the image of the company, for example, how environmentally responsible the company is. In this regard, public relations plays an important role in presenting, through news reports, sponsorships, "advertorials" (a form of advertising that instead of selling a product or service promotes the company's views regarding current issues), and other forms of communication, what the company stands for. Direct marketing, the oldest form of marketing, is the process of communicating directly with target customers to encourage response by telephone, mail, electronic means, or personal visit. Users of direct marketing include retailers, wholesalers, manufacturers, and service providers, and they use a variety of methods including direct mail, telemarketing, direct-response advertising, online computer shopping services, cable shopping networks, and infomercials. Traditionally not viewed as an element in the promotional mix, direct marketing represents one of the most profound changes in marketing and promotion in the last 25 years. Aspects of direct marketing, which includes direct response advertising and direct mail advertising as well as the various research and support activities necessary for their implementation, have been adopted by virtually all companies engaged in marketing products, services, ideas, or persons. Direct marketing has become an important part of many marketing communication programs for three reasons. First, the number of two-income households has increased dramatically. About six in every ten women in the United States work outside the home. This has reduced the amount of time families have for shopping trips. Secondly, more shoppers than ever before rely on credit cards for payment of goods and services. These cashless transactions make products easier and faster to purchase. Finally, technological advances in telecommunications and computers allow consumers to make purchases from their homes via telephone, television, or computer with ease and safety. These three factors have dramatically altered the purchasing habits of American consumers and made direct marketing a growing field worldwide. Direct marketing allows a company to target more precisely a segment of customers and prospects with a sales message tailored to their specific needs and characteristics. Unlike advertising and public relations, whose connections to actual sales are tenuous or nebulous at best, direct marketing offers accountability by providing tangible results. The economics of direct marketing have also improved over the years as more information is gathered about customers and prospects. By identifying those consumers they can serve more effectively and profitably, companies may be more efficient in their marketing efforts. Whereas network television in the past offered opportunities to reach huge groups of consumers at a low cost per thousand, direct marketing can reach individual consumers and develop a relationship with each of them. Research indicates that brands with strong brand equity are more successful in direct marketing efforts than little-known brands. Direct marketing, then, works best when other marketing communication such as traditional media advertising supports the direct marketing effort. Direct marketing has its drawbacks also. Just as consumers built resistance to the persuasive nature of advertising, so have they with direct marketing efforts. Direct marketers have responded by being less sales oriented and more relationship oriented. Also, just as consumers grew weary of advertising clutter, so have they with the direct marketing efforts. Consumers are bombarded with mail, infomercials, and telemarketing pitches daily. Some direct marketers have responded by regarding privacy as a customer service benefit. Direct marketers must also overcome consumer mistrust of direct marketing efforts due to incidents of illegal behavior by companies and individuals using direct marketing. The U.S. Postal Service, the Federal Trade Commission, and other federal and state agencies may prosecute criminal acts. The industry then risks legislation regulating the behavior of direct marketers if it is not successful in self-regulation. The Direct Marketing Association, the leading trade organization for direct marketing, works with companies and government agencies to initiate self-regulation. In March of 2003 the National Do Not Call Registry went into affect whereby consumers added their names to a list that telemarketers had to eliminate from their out-bound call database. Database marketing is a form of direct marketing that attempts to gain and reinforce sales transactions while at the same time being customer driven. Successful database marketing continually updates lists of prospects and customers by identifying who they are, what they are like, and what they are purchasing now or may be purchasing in the future. By using database marketing, marketers can develop products and/or product packages to meet their customers' needs or develop creative and media strategies that match their tastes, values, and lifestyles. Like IMC, database marketing is viewed by many marketers as supplanting traditional marketing strategies and is a major component of most IMC programs. At the core of database marketing is the idea that market segments are constantly shifting and changing. People who may be considered current customers, potential customers, and former customers and people who are likely never to be customers are constantly changing. By identifying these various segments and developing a working knowledge of their wants, needs, and characteristics, marketers can reduce the cost of reaching non-prospects and build customer loyalty. Perhaps the most important role of database marketing is its ability to retain customers. The cumulative profit for a five-year loyal customer is between seven and eight times the first-year profit. Since database marketing is expensive to develop and complex to implement effectively, companies considering database marketing should consider three important questions. First, do relatively frequent purchasers or high dollar volume purchasers for the brand exist? Secondly, is the market diverse enough so that segmenting into subgroups would be beneficial? Finally, are there customers that represent opportunities for higher volume purchases? Sales promotions are direct inducements that offer extra incentives to enhance or accelerate the product's movement from producer to consumer. Sales promotions may be directed at the consumer or the trade. Consumer promotions such as coupons, sampling, premiums, sweepstakes, price packs (packs that offer greater quantity or lower cost than normal), low-cost financing deals, and rebates are purchase incentives in that they induce product trial and encourage repurchase. Consumer promotions may also include incentives to visit a retail establishment or request additional information. Trade promotions include slotting allowances ("buying" shelf space in retail stores), allowances for featuring the brand in retail advertising, display and merchandising allowances, buying allowances (volume discounts and other volume-oriented incentives), bill back allowances (pay-for-performance incentives), incentives to salespeople, and other tactics to encourage retailers to carry the item and to push the brand. Two perspectives may be found among marketers regarding sales promotion. First, sales promotion is supplemental to advertising in that it binds the role of advertising with personal selling. This view regards sales promotion as a minor player in the marketing communication program. A second view regards sales promotion and advertising as distinct functions with objectives and strategies very different from each other. Sales promotion in this sense is equal to or even more important than advertising. Some companies allocate as much as 75 percent of their advertising/promotion dollars to sales promotion and just 25 percent to advertising. Finding the right balance is often a difficult task. The main purpose of sales promotion is to spur action. Advertising sets up the deal by developing a brand reputation and building market value. Sales promotion helps close the deal by providing incentives that build market volume. Sales promotions can motivate customers to select a particular brand, especially when brands appear to be equal, and they can produce more immediate and measurable results than advertising. However, too heavy a reliance on sales promotions results in "deal-prone" consumers with little brand loyalty and too much price sensitivity. Sales promotions can also force competitors to offer similar inducements, with sales and profits suffering for everyone. Sponsorships, or event marketing, combine advertising and sales promotions with public relations. Sponsorships increase awareness of a company or product, build loyalty with a specific target audience, help differentiate a product from its competitors, provide merchandising opportunities, demonstrate commitment to a community or ethnic group, or impact the bottom line. Like advertising, sponsorships are initiated to build long-term associations. Organizations sometimes compare sponsorships with advertising by using gross impressions or cost-per-thousand measurements. However, the value of sponsorships can be very difficult to measure. Companies considering sponsorships should consider the short-term public relations value of sponsorships and the long-term goals of the organization. Sports sponsorships make up about two-thirds of all sponsorships. Exhibits, or trade shows, are hybrid forms of promotion between business-to-business advertising and personal selling. Trade shows provide opportunities for face-to-face contact with prospects, enable new companies to create a viable customer base in a short period of time, and allow small and midsize companies that may not be visited on a regular basis by salespeople to become familiar with suppliers and vendors. Because many trade shows generate media attention, they have also become popular venues for introducing new products and providing a stage for executives to gain visibility. Personal selling includes all person-to-person contact with customers with the purpose of introducing the product to the customer, convincing him or her of the product's value, and closing the sale. The role of personal selling varies from organization to organization, depending on the nature and size of the company, the industry, and the products or services it is marketing. Many marketing executives realize that both sales and non-sales employees act as salespeople for their organization in one way or another. One study that perhaps supports this contention found that marketing executives predicted greater emphasis being placed on sales management and personal selling in their organization than on any other promotional mix element. These organizations have launched training sessions that show employees how they act as salespeople for the organization and how they can improve their interpersonal skills with clients, customers, and prospects. Employee reward programs now reward employees for their efforts in this regard. Personal selling is the most effective way to make a sale because of the interpersonal communication between the salesperson and the prospect. Messages can be tailored to particular situations, immediate feedback can be processed, and message strategies can be changed to accommodate the feedback. However, personal selling is the most expensive way to make a sale, with the average cost per sales call ranging from $235 to $332 and the average number of sales calls needed to close a deal being between three and six personal calls. Sales and marketing management classifies salespersons into one of three groups: creative selling, order taking, and missionary sales reps. Creative selling jobs require the most skills and preparation. They are the "point person" for the sales function. They prospect for customers, analyze situations, determine how their company can satisfy wants and needs of prospects, and, most importantly, get an order. Order takers take over after the initial order is received. They handle repeat purchases (straight rebuys) and modified rebuys. Missionary sales reps service accounts by introducing new products, promotions, and other programs. Orders are taken by order takers or by distributors. Just as direct marketing has become a prominent player in the promotional mix, so too has the Internet. Virtually unheard of in the 1980s, the 1990s saw this new medium explode onto the scene, being adopted by families, businesses and other organizations more quickly than any other medium in history. Web sites provide a new way of transmitting information, entertainment, and advertising, and have generated a new dimension in marketing: electronic commerce. E-commerce is the term used to describe the act of selling goods and services over the Internet. In other words, the Internet has become more that a communication channel; it is a marketing channel itself with companies such as Amazon.com, CDNow, eBay, and others selling goods via the Internet to individuals around the globe. In less than 10 years advertising expenditures on the Internet will rival those for radio and outdoor. Public relations practitioners realize the value that web sites offer in establishing and maintaining relationships with important publics. For example, company and product information can be posted on the company's site for news reporters researching stories and for current and potential customers seeking information. Political candidates have web sites that provide information about their background and their political experience. The interactivity of the Internet is perhaps its greatest asset. By communicating with customers, prospects, and others one-on-one, firms can build databases that help them meet specific needs of individuals, thus building a loyal customer base. Because the cost of entry is negligible, the Internet is cluttered with web sites. However, this clutter does not present the same kind of problem that advertising clutter does. Advertising and most other forms of promotion assume a passive audience that will be exposed to marketing communication messages via the mass media or mail regardless of their receptivity. Web sites require audiences who are active in the information-seeking process to purposely visit the site. Therefore, the quality and freshness of content is vital for the success of the web site. Marketing communication has become an integral part of the social and economic system in the United States. Consumers rely on the information from marketing communication to make wise purchase decisions. Businesses, ranging from multinational corporations to small retailers, depend on marketing communication to sell their goods and services. Marketing communication has also become an important player in the life of a business. Marketing communication helps move products, services, and ideas from manufacturers to end users and builds and maintains relationships with customers, prospects, and other important stakeholders in the company. Advertising and sales promotion will continue to play important roles in marketing communication mix. However, marketing strategies that stress relationship building in addition to producing sales will force marketers to consider all the elements in the marketing communication mix. In the future new information gathering techniques will help marketers target more precisely customers and prospects using direct marketing strategies. New media technologies will provide businesses and consumers new ways to establish and reinforce relationships that are important for the success of the firm and important for consumers as they make purchase decisions. The Internet will become a major force in how organizations communicate with a variety of constituents, customers, clients, and other interested parties. Arens, William F. Contemporary Advertising. 7th ed. Boston: Irwin/McGraw-Hill, 1998. Belch, George E., and Michael A. Belch. Advertising and Promotion: An Integrated Marketing Communication Perspective. 4th ed. Boston: Irwin/McGraw-Hill, 1998. Cutlip, Scott M., Allen H. Center, and Glen M. Broom. Effective Public Relations. 8th ed. Upper Saddle River, NJ: Prentice-Hall, 1999. Harris, Thomas L. Value-Added Public Relations: The Secret Weapon in Integrated Marketing. Chicago: NTC Books, 1998. Manning, Gerald L. and Barry L. Reese. Selling Today: Building Quality Partnerships. 7th ed. Upper Saddle River, NJ: Prentice-Hall, 1998. Weitz, Barton W., Stephen B. Castleberry, and John F. Tanner. Selling: Building Partnerships. 3rd ed. Boston: Irwin/McGraw-Hill, 1998. Is publicity also a part of Marketing Communication? How about organizing an event?